Our short-term summer weather has been put on hold here in Portland in favor of more seasonal 60 degrees days (with a light drizzle, of course). But it hasn’t stopped me from continuing to use the grill. Today I’m offering two simple recipes for the BBQ that make for a complete meal together and won’t require turning on the oven: Grilled Caprese Salad and Chicken and Salami Skewers. The idea for putting salami on a skewer came from my brother, who ingeniously thought it up while we were skewering up vegetables while snacking on salami slices the other night. I love the way the edges of the salami crisp up on the BBQ. Dare I say grilled salami gives bacon a run for its money? The grilled caprese idea was born out of my extreme excitement for tomato season. Unfortunately, the tomatoes one can get their hands on this time of year bear little resemblance to late summer tomatoes, so I thought I’d give these bland little cherries a boost by lightly caramelizing them on the grill. The heat makes them pop open and creates its own lovely roasted tomato vinaigrette dressing for the salad (with a little help from some good salt and olive oil). I haven’t listed amounts for these recipes because it’s a little difficult for skewers. As usual, I suggest you just go with your gut based on the number you’re feeding and your preferences. We had several chicken and salami skewers left over and they were delicious cold. I’m betting any leftover caprese would be nice the next day as well. Preheat your grill to a moderate heat. 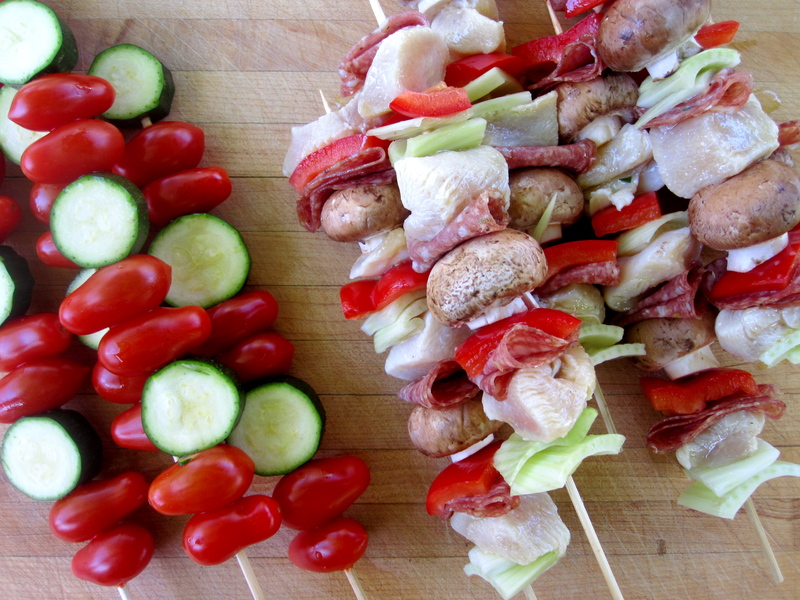 Skewer up the zucchini pieces and the cherry tomatoes – assume two 12″ skewers per person. Drizzle the vegetables lightly with olive oil and season with sea salt. Grill for 3 or 4 minutes per side, or until the tomatoes are just starting to brown and blister. Set aside until cool enough to handle. 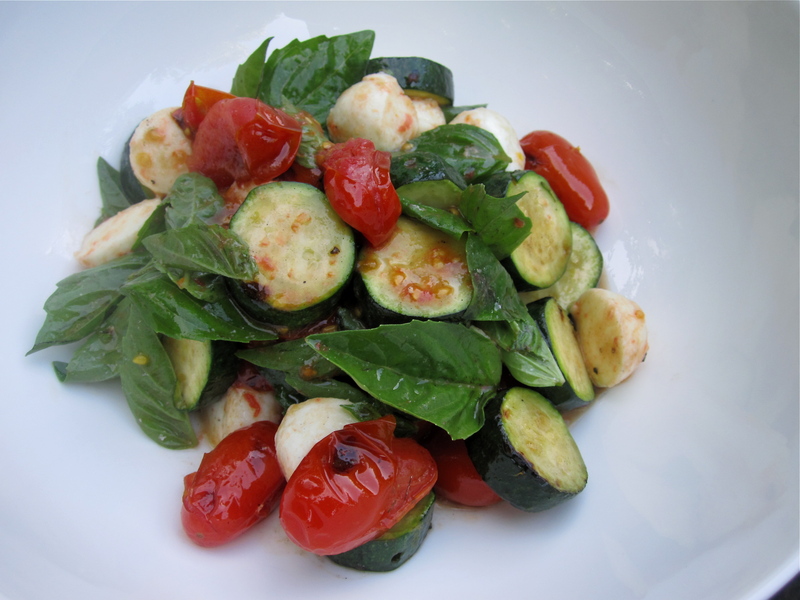 Once slightly cooled, gently slide the zucchini and tomatoes from their skewers and into an appropriately-sized bowl. Add the well drained mozzarella balls along with plenty of basil leaves. Drizzle with more olive oil and a good sprinkling of salt. Toss gently to combine and serve immediately. Marinate the chicken breast at least an hour in advance or up to one day (see ratios above). When you’re ready to make the skewers, preheat the grill to medium heat. 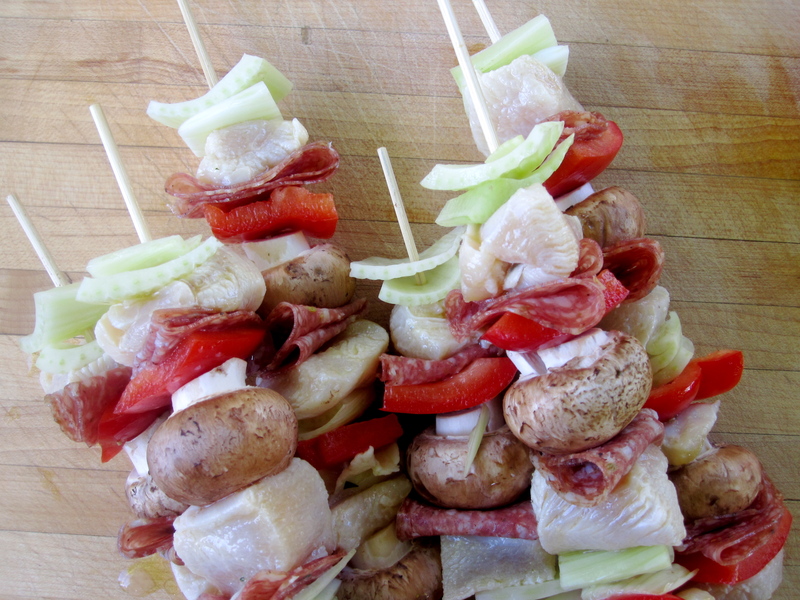 Assemble the skewers with your desired quantities of vegetables, meat, and salami. Drizzle lightly with olive oil and sprinkle with a little sea salt. Grill for approximately 5 minutes per side (assuming 2 sides) and then test for doneness. The salami should be crispy on the edges and the chicken pieces should be just cooked through. Serve the skewers immediately alongside the caprese salad. This entry was posted in gluten free, paleo, perfect health diet, salad, vegetarian and tagged gluten free, paleo, perfect health diet, salad, vegetarian. Bookmark the permalink.